Embracing modern tools and blending them with old skills. Computers and automation are a fact of life in our world. In my experience they take the drudgery and repetition out of certain tasks. For the longest time I resisted them fiercely. I thought they had no place in my life or business. In the 80's our book keeping became computerized and it made good sense. Letter writing was next to follow. Communication was the next in line and I found I could instantly transmit ideas around the world. Feedback was just as fast. I liked it. A lot! In 1998 I used a computer for the first time in my drawing. A digital drawing pad and pen allowed me to stroke a line and the lines would magically appear on the screen in real time. It was mind blowing. The printed results from the computer looked far better than my copied drawings. More importantly I could instantly adjust the size, or change the color without starting from scratch. The work is still very much hand drawn, complete with wiggly lines. The difference is it is done virtually instead of directly on paper. While I still start my sketches on old fashioned paper, I would never go back to the old way of producing the final art. And without regret. 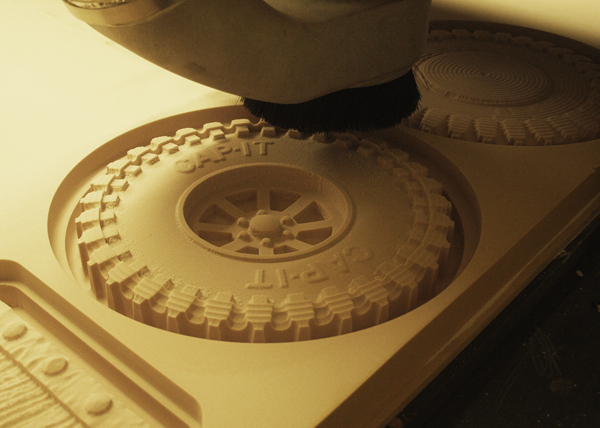 In 2005 I saw a CNC router operate for the first time. I was amazed. And I had to have one in our shop. The learning curve was brutal, the investment MASSIVE, but the result was nothing short of amazing! I could imagine something, work out the ideas in my head, then build it virtually on my computer and send it to the router for production. I stood mesmerized, watching with awe as the big computerized machine carried out my wishes and thoughts, seemingly all by itself. Some people saw it as a sellout - and believe the things I create are done with the simple push of a button. The reality is so much different. The creative process is the same - no matter what the production method. The difference is it takes place at my design desk instead of in the shop. Even so, with the router, the computerized part generally only helps me half way along the production process. Assembling, hand carving or sculpting the details and painting is generally more than 50% of the balance. And as I labor I am glad for he help I received, no different in fact from the many helpers I employed in the past. The difference is my router happily works through the night if I ask, takes no breaks and will work overtime at the same rate as regular time. It does all this and at a rate of five times the speed at which I could do the same task. It also does the tasks I send it EXACTLY as I imagined - something I could never get the hired help to do. The CNC router allows us to do things I could never dream of before. We've now owned the machine for five years and have in fact become a world leader in creative, computer automation. With the advance of technology and our increased experience it is time to ramp things up one more notch. We will be working with leading CNC manufacturer, MultiCam and a software company, EnRoute, with a new four axis CNC router very soon. Our goal is to take this new technology to places no one has yet imagined. In the process we will continue to produce our art and signs in ways that capture the imagination of those who see them. My continuing goal is to marry modern technology and tools with old world skills to create my art. It will be an exciting journey!